Iowa Senator Chuck Grassley says he hasn’t yet been given a security briefing on the latest flexing of North Korea’s military muscle, but he is following the situation closely. As most Americans celebrated the Fourth of July, North Korea launched its first intercontinental ballistic missile. It flew for 39 minutes and — according to the North Koreans — precisely hit a target in the Sea of Japan. From what he’s been told, Grassley says the rocket is powerful enough to reach the U.S.
he U.S. and South Korea fired missiles into the waters off South Korea in a response that some interpret as a warning. Grassley says the U.S. response to the ICBM launch has prompted an emergency gathering of top United Nations officials. 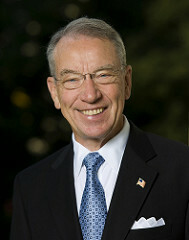 Grassley says, “Since China and/or Russia have veto power in the U.N., it’s very important that they see this as a serious move and that they will seem to cooperate with other nations, led by the United States, that want to take some action against North Korea.” Until now, that action has been predominantly economic sanctions. Grassley says it’s possible China may be able to pressure North Korea to back away from its nuclear aspirations.